I've posted before on my eternal search for the holy grail of mascara. I've tried every brand in every price point out there over the years and I've found a few that I like and are trusty stand-bys. 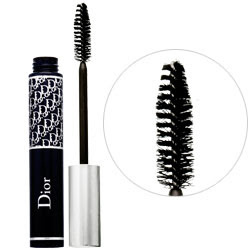 When Diorshow first broke onto the mascara scene, I was one of the first in line to purchase it. And I have to be honest, a novice, less-seasoned me wasn't too hot and bothered about. Maybe I didn't have much to compare it against, but for whatever the reason I moved on to the next brand to try. But after years of this hunt and research on application techniques and mascara woes, I've learned an important lesson in the mascara game: patience is key. Mascara is all about building layers to achieve the look that you want; Apply a coat, letting it dry, and re-applying is paramount to a successful mascara application. This technique also allows for some flexibility; you can dial back the dramatic lashes during the work day and amp it up for a night out or when you are feeling particularly sassy. This go-round with DiorShow was much different and fantastically better. Call it a few years older and maybe a smidgen wiser, but I really did enjoy the mascara this time. The consistency was thick enough to provide volume, the brush itself helped separate and lengthen, and the mascara stayed put the entire day - no running, smudging, or the like. Also, it was an easy formula to build layers on top of; it dried quickly and really held true without getting clumpy and delivered a really fantastic finished product. Don't believe me? Check it out below! My take home message: If you are willing to splurge on a mascara, I think DiorShow one is definitely one to do it on! People StyleWatch provided the mascara for this beauty review, but the opinions contained herein are my own.